PHOENIX — In a case that seems to be about he said/she said/he said, one thing is for sure: DREAMers say they are still not clear on the potential future of the program that allows them to stay in the United States. It’s been less that 24 hours since news broke that the two main Democratic leaders had reached an apparent agreement with President Donald Trump regarding the Deferred Action for Childhood Arrivals program, or DACA, and already multiple versions and contradictions as to what really happened during that meeting have been reported. Senate Minority Leader Chuck Schumer (D-New York) and House Democratic Leader Nancy Pelosi (D-California) announced Wednesday night they discussed the future of DACA with the president, and agreed to include additional border security measures. Both legislators, however, did say the negotiations excluded the border wall. But then, the tweets started. And then Trump himself seemed to contradict what Schumer and Pelosi had put out just hours earlier in a joint statement. A series of messages from him seemed to send a clear message: No official deal has been made, yet. The president said he wants to protect DREAMers, but also put in place what he called “massive border security” and that the wall is still happening. Here in Arizona, advocate organizations and DACA recipients had mixed feelings about the news, and said they feel uncertain about what border security measures Democratic legislators are referring to and what Trump’s “massive border security” statement would mean for their families. “It’s a political game and the Democrats are playing it,” she said. Advocates also said they want to be cautious about future negotiations and how those could affect other immigrants who are not DACA recipients. 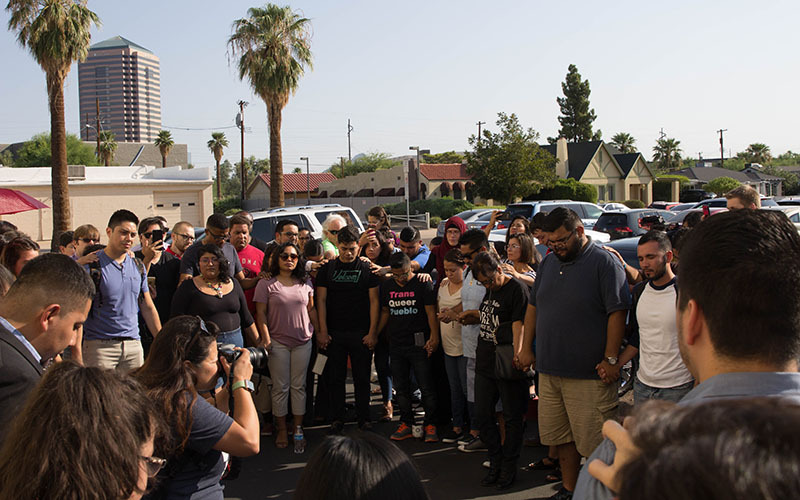 “We’re focusing on the DREAMers, but there’s still 11 million undocumented folks in this country, so how are we approaching a comprehensive immigration reform for folks that do not qualify under the prior administration’s DACA program,” said Eduardo Sainz, director of Mi Familia Vota in Arizona. During his trip to Florida on Thursday, Trump said to reporters an agreement to protect DREAMers was “fairly close,” and doubled down on his previous comments about including border security measures on any legislation that might be put in place. 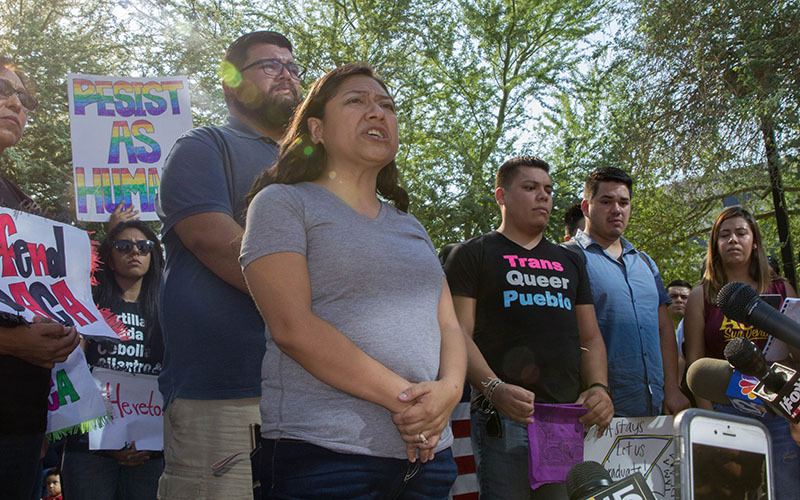 Some local Phoenix organizations said they want to focus on the possibility that an agreement to protect DREAMers could be underway. Lydia Guzman, spokesperson for Chicanos Por La Causa, said she believes this conversation might pave the way for an agreement. “I’m glad that Trump is talking to the Democrats, because if we’re going to work on an immigration policy, you should have bipartisan support. He (Trump) has to be the leader in creating this dialogue. He needs to continue talking to democrats to create bipartisan support,” she said. Regardless of what these recent announcements could mean for the future of DACA, recipient Cristian Avila is setting his sights on what he believes should be the real priority. “Our main focus right now should be Congress and the Senate since they’re the ones that can pass something,” he said. Despite this latest episode only adding to the unstable political climate surrounding a potential deal for the DACA program, Avila is staying optimistic. “I think we’re even stronger now than we were before, when the original DREAM Act was trying to get passed. We’ve already tasted victory with DACA, we’ve already come out of the shadows and I think many of us are not willing to go back,” he said.